The Darkness Rises from Within! Bring legendary heroes and infamous monsters to your Descent: Journeys in the Dark Second Edition game with the Shards of Everdark hero and monster collection. Explore the unique strengths and abilities of these monsters and heroes by playing the included quests individually or through the use of Rumour cards. With 4 heroes, 3 monster groups, and 2 new quests, the Shards of Everdark hero and monster collection gives fresh options to your Descent: Journeys in the Dark game! 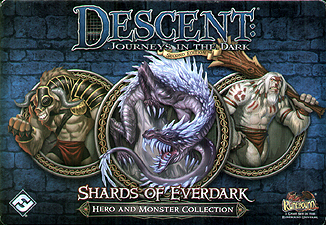 Descent: Journeys in the Dark, Second Edition is required to play.